Happy Kitchen Sink Stamps Monday! Not only is it Kitchen Sink Stamps Monday, there's a NEW Release in the Kitchen - Year of Thanks II. Remember, you can save 10% on all your purchases at Kitchen Sink Stamps, simply enter LISA10KSS at checkout! Inside this years tin, there's 12 beautiful Thank You stamps, along with a beautiful Multi Step Lilly of the Valley stamp. Or as we called them when I was a kid - Lilly of the Alley. I just LOVE these wonderful images! Looking to stretch your stamps a bit further, use the Omitting Technique when stamping your images, now you can combine the images with other Kitchen Sink Stamps sentiments! Today is also Challenge Day in the Kitchen. Maria is the hostess this month - her challenge just in time for the holidays is Wrap It...Bag It....or Tag It (however you choose to decorate your gift). Remember designs must use only Kitchen Sink Stamps to be eligible for the contest. You have until December 31st to enter, for full contest details, click here. Here's some inspiration using images from the new Year of Thanks II. I created a Gift Card Box (the pattern is on my blog - I'll link it in once I locate it), and used image #3 stamped in Memento Rich Cocoa on White (I omitted the sentiment), masked the image then stamped image #4 in Memento Summer Sky (again omitting the sentiment), punched with the image with Stampin' Up! 's Small Tag Punch, layered onto a larger tag, tied it onto my bow with some Gold Cording, then lightly spritzed the entire box with Pearl Glimmer Mist. Here's another Gift Box idea, using a leftover gift box from last year. 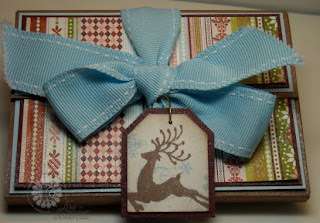 I altered the box by adding the Black card stock and Basic Grey Pattern Paper and Tag. Again using the Omitting Technique I stamped the Heart - image #5 on White card stock in Memento Rhubarb Ink, then stamped the sentiment from Kitchen Sink Stamps Vintage Words in Black, cut the stamped image with Spellbinders Circle Dies, layering on a Black Circle, then adding the tag to the box. I just love creating ornaments, yes this one actually fits the Kitchen Sink Challenge too! 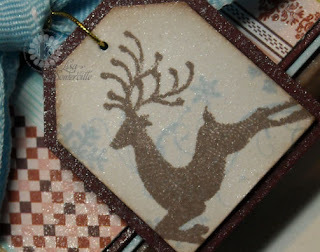 I stamped image #3 from Year of Thanks II on a Cosmo Cricket Tag, then cut the tag down to fit into my ornament. I used the Bow Easy to tie the beautiful ribbon (source unknown) and adhered it in place with a Glue Dot. 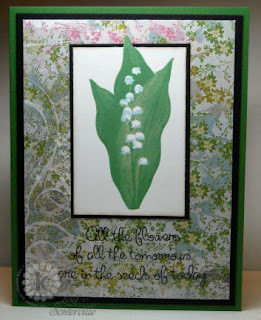 My card uses the beautiful Multi Step Lilly of the Valley - which is also included in the Kitchen Sink Stamps Year Of Thanks II Tin. The image was stamped using the Out of the Box Technique and the following steps: #5 Memento Cottage Ivy, #4 Memento Cottage Ivy, #3 Memento Cottage Ivy, #2 Memento Bamboo Leaves, #1 Memento Summer Sky. The sentiment is from Kitchen Sink Stamps 3 Step Hibiscus stamped in Black on Basic Grey Pattern Paper. Great projects!! Love them all!! These are great, I love the Lillie of the Valley stamp, your coloring is fabulous. Oh Lisa! These are all so wonderful!! 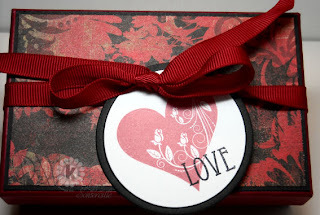 Love all your tags, and the lilies of the valley card is just soo pretty...I have not see it stamped yet...LOVE IT!! I love what you have created with the thank you images!! 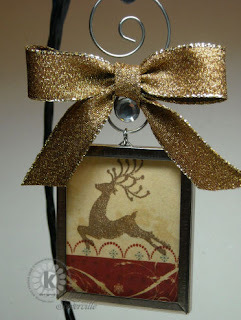 The reindeer and snowflake shimmery tag is absolutely awesome!! I see so many fun possibilities with these sweet little images!!! Beautiful, beautiful work, Lisa! So glad you used the lily of the valley. I haven't had time to try it out yet!! Impressed how you can be so creative at this busy time of the year, yikes....I want to be Lisa! Your projects are ALL just beautiful, each and every one!! and the Lily of the Alley is super. Each project is fabulous! ... oh the lucky recipients! Love these! Beautiful, creative & quite inspirational!